The Wheel Half Hub Cup Handling tool is a complete system designed to remove and assemble wheel hub cups avoiding damage to the wheels. Using the Hanley Smith Half Hub Cup tool cups can be removed cold. For reassembly the wheel needs to be heated and the cup chilled to render a non-interference condition. 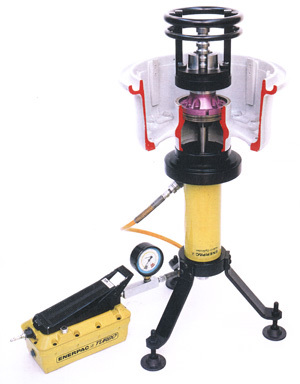 The tool is a free standing unit and can be sited conveniently within a wheel service bay. The tool is driven by a hydraulic cylinder capable of exerting up to 30 ton maximum force via the draw bar. This in turn is supplied by a free standing air hydraulic pump that is controlled with a foot pedal connected to an air line source. The tool has adaption tooling to suit each size of wheel, consisting of support rings and collets. The support ring aligns the wheel on the Hub Compressor and then using the appropriate collet to locate in the wheel bearing bore the cup can be pressed in or out as required.